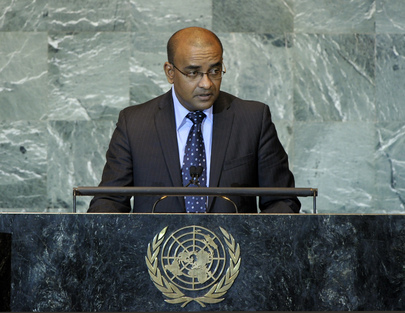 BHARRAT JAGDEO, President of Guyana, said this would be his last address to the Assembly and he was proud to be the first Guyanese President to leave office under the constitutional term limits he had himself signed into law. Looking back over the past 12 years, it was striking that, in spite of the timeless values of peace, equality and justice that informed the work of the United Nations, challenges to the international community had changed dramatically. The rise of China, India, Brazil and other developing countries in a world that was interconnected through instant communications and globalized trade and finance presented the Organization with great opportunities. However, collective action was needed to take advantage of them, and the recent record on that front was not good. Human security required not only physical security, but the realization of human rights and meeting the challenges of food, energy and resource security in an ever more populous world, he said. In addition, the challenge of climate change must be met if the biggest economic and social catastrophe ever seen was to be averted, he warned. Unfortunately, the increase of 4° or 5°C, which now seemed inevitable, represented a disaster beyond anyone’s comprehension, and the failure to treated it as such would be viewed by history as the biggest-ever derogation of responsibility on the part of Governments and societies. Those challenges were also opportunities in the sense that there was enough human ingenuity and resources to improve the situation and create new platforms for peace, development and physical security. That could happen through integrated, sustainable development in which responses to security challenges were integrated, changing global paradigms, he continued. Since food, energy, minerals and other commodities were increasingly provided by the developing world, it could lead the transformational shift required, he said, noting that much of the structure needed to solve problems in an integrated way already existed within the United Nations. Next year’s “Rio+20” Conference could be a starting point for the necessary changes. For that to happen, however, consistency was needed in efforts to address all forms of insecurity, he said. Underscoring that peaceful peoples everywhere must be supported in asserting their basic rights, he said the global response to the Arab Spring was “remarkable for its inconsistency”, and also supported the right of the Palestinian people to full statehood. Around the world, support for development, food, energy and resource security must be rapidly upgraded, and efforts to complete the Doha Trade Round, as well as to meet the Millennium Development Goals, redoubled. Finally, the world must “move beyond the global insanity that is our response to climate security”, by building trust between the developed and developing world, he stressed, adding that Guyana’s Low Carbon Development Strategy, developed in cooperation with Norway, could be a model. In order to make progress in all those areas, he said, the Security Council must become more democratic through an expansion in both the permanent and non-permanent membership categories. There must also be enhanced representation of developing countries. Practical solutions to all current crises were also needed, and the developed world must realize that it was in their respective, vital national interests to do the work that needed doing, given the effects on all countries of a failure to fulfil such tasks. “The narrative is changing, distinguished colleagues, and I hope that we will rise to the challenge,” he said.